Liberty street is a fairly long street that runs south from Caldwell Street to Durand Gardens. It was one of the last streets of purpose-built mansion block flats to be built in this area, with construction taking place in 1902. It is unclear as to why the street was named Liberty Street. 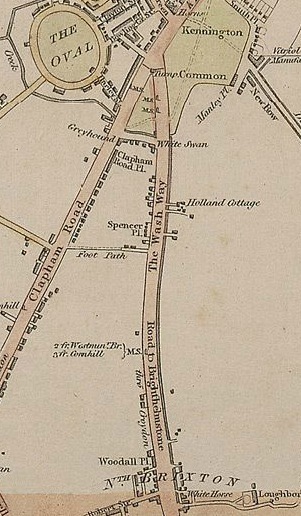 Liberty Street was once part of a large plot of land that was originally open countryside behind the Clapham Road. The whole site stretching from Clapham Road to the back of the houses on Hackford Road was used for a variety of purposes. At first it was fields and gardens, then a marble rink stood here (an old fashioned name for a roller skating rink) and then Sir Joseph Causton bought a large chunk of the land to build his printworks. The printworks building still stands facing Clapham Road today, having been converted into flats. The remaining part of this patch of land was then sold to the builders of Liberty Street. 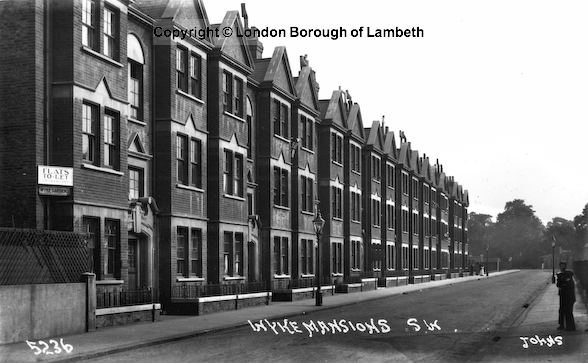 For many years Liberty Street consisted of one row of mansion flats called Wyke Mansions which still stand today. These fifty four flats would have faced a medium sized field between the street and the back of the printworks, giving the feel of open space. 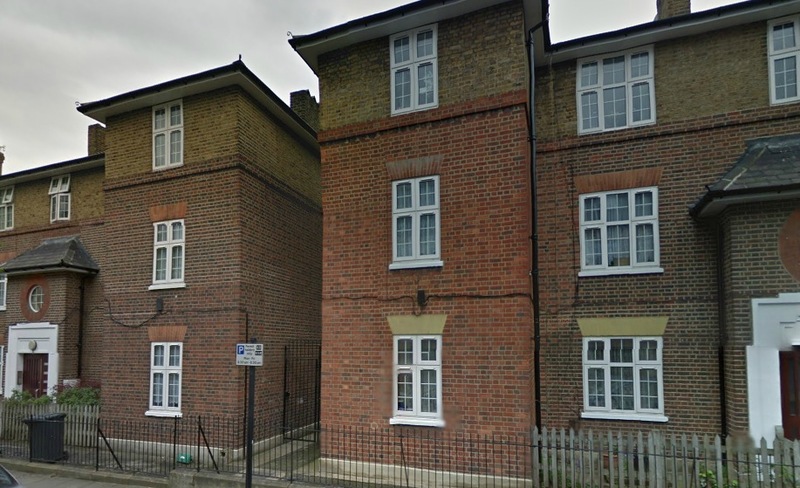 Liberty Street’s housing stock was then extended in the early 1930’s when Wkye Mansions (as seen above) found itself attached to a new addition, a council housing block which is still standing today. It was around the same time that Causton’s Printworks was sold to Freeman’s Ltd (of the catalogue fame) and in order to accommodate their huge range of stock Freeman’s build large warehouses and offices on the patch of land facing Liberty Street, the houses no longer looked onto open space. The land at the very top of the street facing Wkye Mansions was sold to various small companies including a bakery. The street stood in this manner until 1996 when the industrial buildings at the top of the street were demolished and a small gated community called Bakery Close was built on the site. Then in 2009 Galliard Homes converted the entire Freeman’s site into an apartment complex. The builders tore down the ugly industrial buildings facing Liberty Street and replaced them with modern flats, for the first time in it’s history Liberty Street now has houses on both sides. 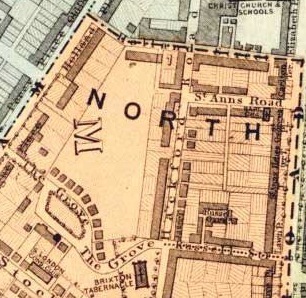 There are also two new roads which cut through the converted printworks, Lett Road and Printer’s Road, both of which connect to Liberty Street. 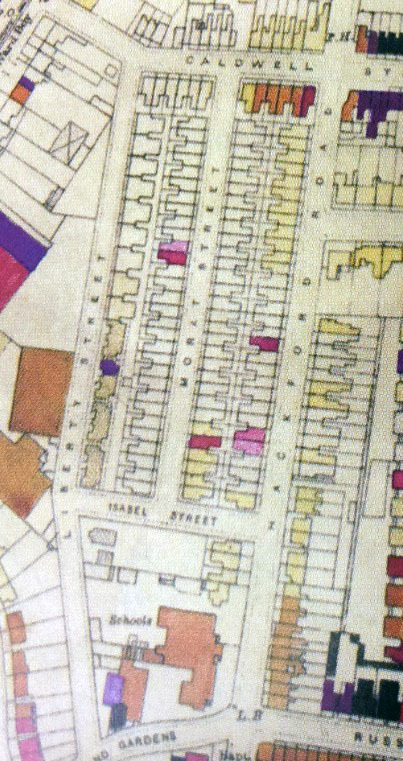 The southern part of Liberty Street after the junction with Isabel Street, now remaned Van Gogh Walk has never really had any noticeable features, it consists of the back wall of the houses on Durand Gardens and the side wall of Hackford Road school. The map above is “Laurie and Whittle New Map of London with its Environs, almost all of the streets that we know so well had not yet been built including Liberty Street, the area was mostly open countryside. 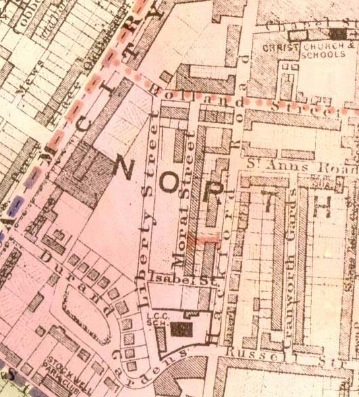 The map above is a Lambeth Ward Map from 1876 showing the division between the Vauxhall Ward (light blue) and the North Brixton Ward (pink) Liberty Street is yet to appear. Liberty Street can be seen here on this 1918 Ward Map. You can see the open space that much of the street faced. In September 1940 the government started to collect and collate information relating to damage sustained during bombing raids, the map further down this page is from 1945 and shows all WW2 bomb damage to Liberty Street. The street emerged almost unscathed in comparison to surrounding areas however it was hit once, unfortunately with the loss of life. On September 27th 1940 there was an air raid on the area, hitting Freeman’s building with the loss of 23 lives. During this same raid a bomb also fell on number 61 Liberty Street, part of the council block next to Wyke Mansions. The bomb hit the left hand side of the block, coming down worst on Albert and Emily Puddicombe’s flat, injuring their 11 year old daughter Gladys who sadly died the next day in hospital. See the below image for modern day signs of the bomb damage. The above map shows the bomb hits on and around Liberty Street. The one main bomb hit is indicated in purple – the legend to the right of the map tells us that meant ‘Damaged beyond repair’ this is number 61 Liberty Street. Who lived there in 1911? Something to be aware of… the street has since been re-numbered, the street numbers below are those indicating the flats within Wyke Mansions. 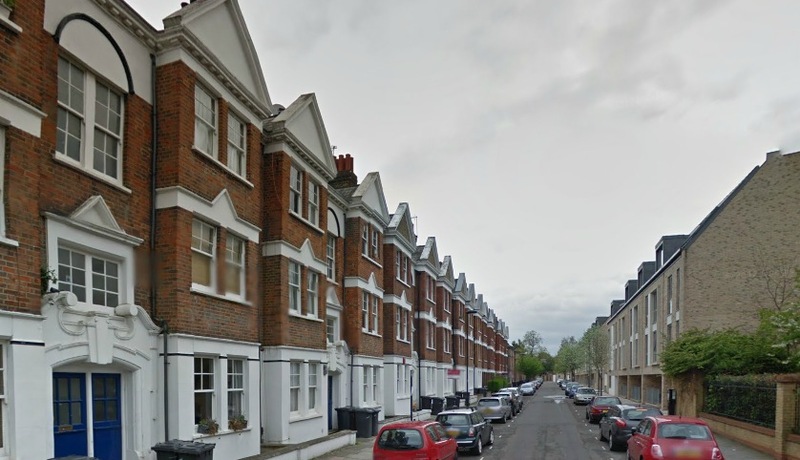 It is possible using google streetview to work out which flat is which by starting at the top of the street and counting along, there are six flats to each block. At number 1 lived Alfred Stone age 30 a housepainter. He lived here with Florence Stone his 23 year old wife whose profession is listed as caretaker to the flats. At number 8 Liberty Street lived Edward Steer a 53 year old ‘Lunatic Attendant’ who worked at the Bethlem Royal Hospital to the north of Kennington (from which we derive the word Bedlam). He lived here with his wife of 28 years, 53 year old Celice an Irish theatrical costumer. The census tells us that she had given birth to nine children, only six of them surviving. Edward and Celice lived here with a son, 18 year old Edward and two daughters, 20 year old Elizabeth and 16 year old Mary. At number 10 lived Adrian St Lawrence, a 36 year old music hall artist from Brentford. He lived here with his 20 year old wife Gertrude, also a music hall artist. They had a newborn baby called Geoffrey. At number 15 lived 51 year old retired naval pensioner Henry Jennings with his wife Edith. At number 23 lived Edith Jane Nutt, a 44 year old widowed dressmaker from Worthing in Sussex. The census states that she was married for three years before becoming widowed. She worked from home. At number 30 lived Elizabeth Squire, a 52 year old theatrical costumier from east London. She lived here with Mary Ann Robins her 73 year old mother and Mary Squire, her 27 year old daughter who worked as a bar attendant in a theatre. At number 40 lived Henry Woods, a 49 year old hosiers assistant from Richmond, Surrey. He lived here with his 44 year old wife Kate who was from Hackney. The Woods shared their flat with their 22 year old daughter Elsie Walker, her husband; 41 year old Edgar Walker and their 1 year old daughter Lucy Sophia Winifred Morgan Walker. At number 43 lived William Morton, 28 of Wick in Warwick. His profession is listed as a commercial traveler in cinematographic films. He lived at number 43 with his wife Helen, a 23 year old German. They had two lodgers, Glaswegian Norah Irving , age 28, living off her own means along with her 9 year old son William. At number 50 lived Lilian Wynford a 22 year old professional singer from London. Lilian is listed as being a widow with a 3 year old son called Joseph. She lived here with her mother, 45 year old Alice Fletcher of no occupation. We often think of modern London as the ultimate cosmopolitan mixture of people however, it is easy to see from examining the 1911 census that this area has always been varied and colourful. It came as no surprise to find that living next to cab drivers and naval pensioners were actors, singers, variety stars and those connected with the running of theatres. From the turn of the century this area was packed with theatrical people due to it’s cheap lodgings and proximity to the West End. As well as housing stars of the stage, the 1911 Liberty Street census reflects the diverse area of the time. There were young widows, old spinsters, a surprising amount of young children, people from around Europe, the living setup varied too, there were some flats with one tenant, some with six. I was born in Clapham North in 1938 and lived in the Bedford Road area with two sisters one 4 years older the other 4 years younger than me. We lived with our parents and were bombed out by a doodlebug raid in the summer of 1944 and were then re-housed at No 10 Liberty Street where we stayed until 1954 – at which point we went to live in Stockwell – where I still live. Obviously it was interesting to see your narrative information about No 10. Hi can you remember who lived in no 5? I am thinking of Amy and Albert Miller and some other tenants? We lived at number 7 Liberty street and my mum and dad were friends with a couple named Fred and Pauline Miller and I know that Fred had a brother who lived in the block next to us. I lived at number 7 Liberty street with my mum and dad from about 1953 to 1970. Miss Rose lived next door to us, I remember she had a golden retriever dog . Ian – we live at no. 10 now. Let me know if you fancy popping round for a brew and to have a nose around.